I got this recipe from my friend, Stacy. It’s not the typical white chicken chili that I’ve had before, but it’s really good. And its super-simple. You put everything in the crockpot and turn it on. That’s it! I made a double batch so I could have some for myself and sent the rest with The Pretty One. 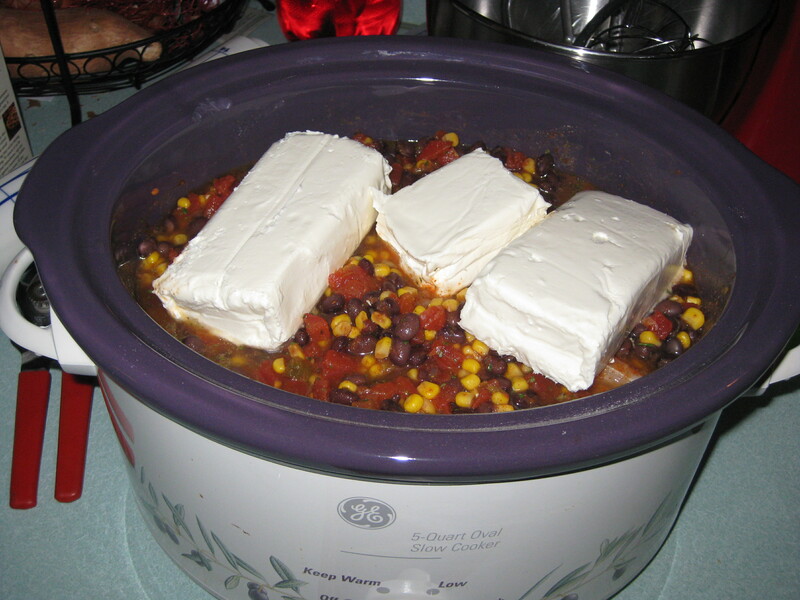 If you make a double batch, make sure you have a large crock pot – mine’s a 5-Qt. and you can see how full it was.You can start with frozen or fresh chicken. If you don’t like corn (you know who you are, NM! ), you can leave it out. If you do that, I suggest adding more beans – probably navy beans or white kidney beans. Rinse and drain them, and add about 1/2 a can of water to replace the corn liquid. While I found the chili to be nicely seasoned, if you like a hotter chili use the hot Rotel instead of mild, or add some chopped fresh jalapenos to the mix. Click for recipe. Don’t worry about putting the cream cheese in with everything else – it’ll be fine. However, if you’re going to leave this to cook much more than 8 hours, you might want to wait and stir it in right before serving. Load up the crock pot before you leave for work, and when you get home, dinner’s ready. Simple, right?